The fall leaves in Minnesota are beautiful! Autumn afternoon walks are full of ooh’s and ahh’s, and we don’t want to see it end. 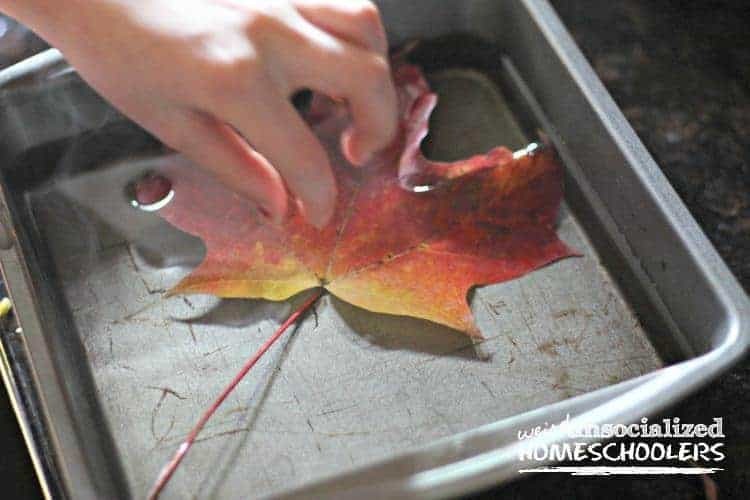 To capture some of that fall beauty, the kids and I like to use a glycerine solution to preserve fall leaves. The process was simple, but it takes several days, so be patient. Here’s what we did to preserve some of our favorite fall leaves. If you’re collecting colorful fall leaves from the ground, their stem shaft has already closed. It’s probably starting to dry and get brittle. You could always just press your leaves between some book pages and preserve them that way. However, a glycerine solution will preserve the leaves in a way that keeps them pliable and helps them maintain their vibrant colors for years to come. Step 1: First, you need to open the stem shaft again. We just gave the stems a couple of taps with a hammer to open them up. Note: We did our leaf preservation project with freshly fallen leaves that had not started to turn brittle yet. Step 2: Make the preservation solution using two parts boiling water to one part glycerine. You can find glycerine in the health and beauty section of your drugstore or on Amazon. While the water heats up, measure the glycerine. After the water comes to a boil, slowly and carefully add the glycerine and stir. Step 3: Now, carefully submerge your leaves in the mixture. We used a shallow baking dish which worked great. Make sure to cover the leaves fully. We put all of ours into one bowl. Now you have to be patient because the solution has to work its magic for 5-7 days. We allowed our leaves to soak for five days, and they turned out great! They were all shiny and glossy after their week at the glycerine spa. We laid them flat on a newspaper and left them to dry for a few hours. The leaves remained glossy even after they were dry. Now we can bend them, and they won’t crack and break into a million pieces. The color is preserved, and we can use them for decoration. Enjoy the beautiful fall season before the weather gets too cold! Your preserved leaves will remind you of the lovely fall you enjoyed. Do you have any creative ideas for what to do with preserved leaves? I’ve never known how to preserve leaves. My 17 year old daughter would love this because she’s obsessed with autumn and always keeps a collection of the first leaves that have fallen. I’ll be passing this along to her, fo sure! That is so cool! I love to decorate my house for fall with fallen leaves, but they always shrivel up and don’t look as nice after awhile. And I actually have glycerin because I make my own body wash and hand soap. The only bad thing is that our leaves are pretty much done for the year. I will be pinning this for next year!